Guys, trust me on this one: every woman loves to get flowers. Yeah, yeah - even on Valentine's Day. Even when she says not to bother, or that Valentine's Day is stupid. She will love flowers. Don't worry over what kind, or how big, just trust the pros at Amore Fiori in the Stapleton Town Center to guide you in the right direction! You can order online (check out their featured products for great ideas) or call in your order at (303)333-3848, or even stop in to check out their wide array of gifts in the store -- like great smelling soaps and lotions, or funky jewelry, or handmade chocolates from Stapleton business Sweet Nothings Chocolate Co.
And if you head over to Amore Fiori's Facebook page and like them, you'll get 20% off your Valentine's Day order! Check out their helpful Guy's Guide to Valentine's Flowers, and just remember: you can't go wrong with flowers. And all the money you spend in our local businesses helps our schools. Honey, I love tulips, and it's the tulip time of year! I sent this to my husband last week and he took the hint (wise man!). I received some lovely pink tulips this morning and they were exactly as he ordered. We will definitely be using Amore Fiori again! Love it, Julie! I got my tulips, too... 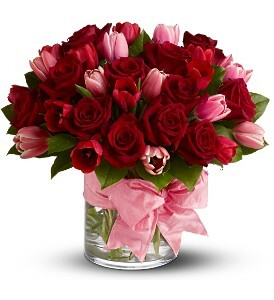 I wonder how many ladies got tulips?